The calm and grey Baltic Sea has been the source of life for coastal folk for centuries. Fishing and seal hunting has been the main source of income for the islanders living on the larger and smaller islands scattered along the coast. Back in the dawn of Middle Ages, Estonia was a home to some of the most notorious seafarers roaming the nearby seas. Later, several Estonian towns, including the capital Tallinn, became prosperous medieval gems still admired today, thanks to the Hanseatic League trade route supplying Flanders and England with Estonian timber, furs, resin, flax, honey, wheat, and rye. 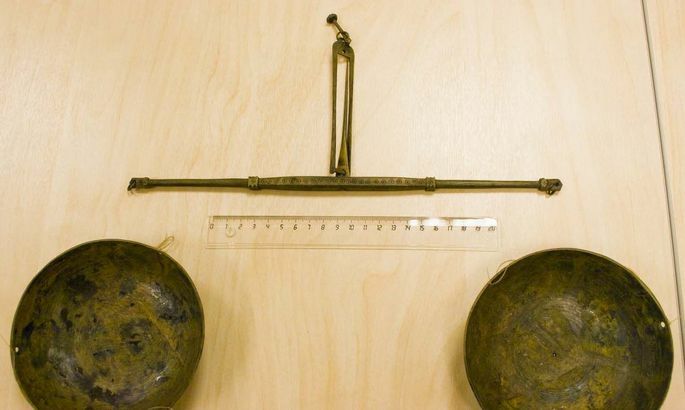 Weight found (2011) at depth of 7m near shore in Tallinn Bay. A wooden hatchet from the last quarter of the 13th century, containing 143 coins, folding brass scales, a set of tin weights, knives, straps, etc. The Baltic Sea connects to the Atlantic Ocean by the narrow Straits of Denmark, and thus Estonia does not have significant tides, and the sea water is low in salinity. Due to its favorable geographic location at the intersection of shipping routes between Russia, Scandinavia and continental Europe, Estonia has historically been a sought after spot for conquerors. Traces of military activity can be explored even today as many shipwrecks are accessible to freedivers. Depth to the wrecks varying from 2 to 50m. Most recent interesting found (2014) is submarine Akula (built 1906-1910, sunk 1915, depth to the seabed at site 28m). Estonian mainland coastal line is 1242 km long. There are about 1500 islands and about 1500 lakes. Estonia claims to have 200 rivers. Estonia’s curvy and variegated coastline is not densely inhabited and very natural – there are sand beaches, stony areas, cliffs, reed beds and also muddy areas where you’d find a range of bird species and seals – one rarer than the other. The water area of ​​Estonian National Parks are the best places to observe and freedive with seals. Visibility under water in a good day can be up to 10m. Since seals can usually be found in lower water (4-5m), an unforgettable experience does not necessarily require a long diving experience. Freediving with seals is therefore also suitable for beginners. Even though seals can be just snorkeled under water, the best way to get their attention is to swim slowly or calm down on the seabed and avoid sudden movements that might scare the seals. Because the seals are curious, they usually come to see you.